Some believe that loss of appetite in the elderly is a normal part of aging. In part, this is due to a decrease in physical activity and resting metabolic rate associated with getting older. However, loss of appetite can also be an early warning sign of a greater health problem, while also increasing the chance of death. The medical term for appetite loss is called anorexia, and it simply implies that a person has no desire to eat. Although it is has a similar name, this should not be confused with the eating disorder common with teen girls and young women, anorexia nervosa. With this disorder, the person is hungry, and yet, they deliberately restrict food consumption because of concerns about weight gain. It is crucial to understand that weight loss is not a normal part of aging, but it is a common symptom with the loss of appetite in the elderly population. There comes a point where the weight loss is life-threatening. In fact, nursing home patients that lost 10% of their body weight had a significantly higher death rate in six months after their weight loss, according to research published in the Journal of General Internal Medicine. Other studies have found that about 13% of male veterans aged 64 and older experienced involuntary weight loss, and the death rate was higher in veterans that lost weight compared to those that didn’t lose weight. Thus, it is important to understand everything about your loved one’s loss of appetite. This article will explain the other signs and symptoms of anorexia besides loss of appetite; what causes the problem; and how to naturally stimulate the appetite of an older person. Once you know, this can play a major role in maintaining the overall health of seniors in society, especially your loved ones and others with appetite loss problems. What are the signs and symptoms of anorexia? The main symptoms of anorexia include not wanting to eat, not feeling hungry, and unintentional weight loss. At the same time, even the idea of eating makes you feel nauseous, where you may vomit if you do eat. When fatigue and loss of appetite are experienced together, it is a good idea to seek medical attention immediately. As a result, other symptoms may include fainting, chest pain, an irregular or racing heartbeat, blurry vision, dizziness, confusion, difficulty tolerating cold temperatures, and sudden weight loss. There are various loss of appetite causes, especially in the elderly. It is common for the average person to experience appetite loss due to a viral or bacterial infection, such as a common cold or flu. However, these illnesses are short-term, and your appetite returns fairly quickly once you get better. In the elderly, there are a variety of factors that can influence a loss of appetite. For instance, aging can lead to changes taste buds, and this can lead to poor food choices or a loss of appetite. Poor fitting dentures can cause discomfort in the gums. As a result, the mouth hurts, and the person may consume fewer solid foods due to the pain. Depression, loneliness, anxiety, sadness, and grief are among the psychological causes that may lead older adults to lose their appetite. Stress and boredom are also linked to a reduced appetite. Sometimes the prospect of eating alone is enough to decrease eating in the elderly. Loss of appetite and nausea are common side effects of various medications, including antidepressants. If you are concerned medication may be the source of appetite loss in you or your loved one, consult with your doctor or health professional. Keep in mind the following health conditions may cause loss of appetite. As Alzheimer’s disease and dementia progress, appetite loss and weight loss become concerns. Many older adults, especially with Alzheimer’s disease, also have nutrient deficiencies like vitamin D.
Loss of appetite is among the first symptoms associated with chronic liver disease and hepatitis (inflammation or the liver). At the same time, patients may experience nausea, vomiting, and a general feeling of being unwell. The loss of desire to eat develops in 10 to 25% of chronic kidney disease patients. Other symptoms also include nausea and vomiting. Loss of appetite is associated with thyroid disorders and certain thyroid medications. Loss of appetite is common among cancer patients, especially lung, ovarian, pancreatic, and stomach cancers. Fatigue, pain, and depressive symptoms from the cancer may also lead to a reduced appetite. What is the best natural treatment for loss of appetite in seniors and older adults? If the loss of appetite is due to a serious medical condition, treating that condition is the best approach for stimulating the appetite. Overall, healthy eating habits must be encouraged with the elderly. A holistic nutritionist or dietitian can recommend the best foods and approach for the root cause of appetite loss. Since loneliness and depression have an association with appetite loss, a counselor or psychotherapist and eating with others can also help encourage eating. Let’s take a look at some of the ways to stimulate appetite in seniors. Sometimes seniors live alone or don’t have a good support group, and so depression, anxiety, and loneliness are common. As a result, the senior may lack the desire to eat. In this case, psychological counseling or psychotherapy can give the elderly company on a regular basis, and possibly give them the desire to eat their food. The elderly often live alone in senior homes with limited support. It helps for seniors to eat with loved ones, friends, and at community or senior centers as much as possible to avoid depression and loneliness that can result in not eating. A dietitian or holistic nutritionist can also help seniors develop healthier eating patterns that provide adequate calories and nutrients while helping to treat any potential root cause of the appetite loss as well. Nutritionists or dietitians can also help set an eating schedule, encourage a diet diary to keep track of eating habits, and recommend nutritious foods that taste good and are easy to swallow. Ginger and other foods can also help stimulate appetite. In general, a high potency multivitamin or mineral formula can provide the elderly with the nutritional support they may otherwise not be getting. It is also important to address certain related nutrient deficiencies. For instance, zinc deficiency is found to be common in people with anorexia. Zinc can also improve the sense of taste and smell for appetite. Many B vitamins can also help balance mood and reduce stress levels. Although eating whole foods are encouraged, certain shakes and meal replacements from reputable natural health companies can also provide proper nutrition when needed. 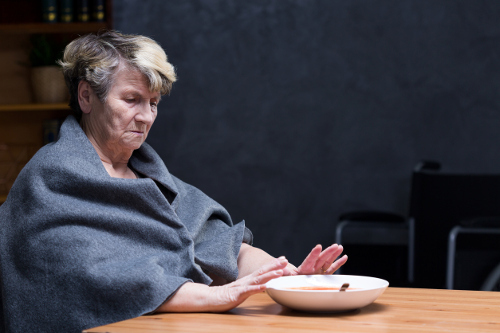 Contrary to conventional belief, loss of appetite is not an eating disorder and is usually a symptom of a greater health problem, especially among the elderly. Keeping busy on a regular basis, and participate in group activities like artwork or other hobbies. As a result, the person will experience reduced depression and desire food when it is time to eat. Try mind-body exercises, such as meditation, yoga, qigong, or tai chi. These will create inner peace and help stimulate the desire to nourish the body. Spend valuable time outdoors in nature, including walking, hiking, or gardening. Going barefoot is called earthing, and it can also help create a connection with nature. Doing this can increase self-worth and the desire to eat. Huffman, G.B., et al., “Evaluating and Treating Unintentional Weight Loss in the Elderly,” American Family Physician, February 15, 2002; 65(4): 640-651. http://www.aafp.org/afp/2002/0215/p640.html. Gaddley, H.L., et al., “Unintentional Weight Loss in Older Adults,” American Family Physician, May 1, 2014; 89(9): 718-722. http://www.aafp.org/afp/2014/0501/p718.html. “What causes anorexia? 160 possible conditions,” Healthline, September 10, 2012; http://www.healthline.com/symptom/anorexia, last accessed April 25, 2017. Greenberger, N.J., “Loss of Appetite,” Merck Manual Consumer Version; http://www.merckmanuals.com/home/digestive-disorders/symptoms-of-digestive-disorders/loss-of-appetite, last accessed April 25, 2017. “Dealing with Loss of Appetite in the Elderly,” American Senior Communities, November 25, 2014; http://www.ascseniorcare.com/dealing-loss-appetite-elderly/, last accessed April 25, 2017. Pilgrim, A., et al., “An overview of appetite decline in older people,” Nursing Older People, June 2015; 27(5): 29-35, doi: 10.7748/nop.27.5.29.e697. Bareuther, C.M., “Dwindling Appetites,” Today’s Geriatric Medicine, 2010; http://www.todaysgeriatricmedicine.com/archive/082510p32.shtml, last accessed April 25, 2017. Balch, J., et al., Prescription for Natural Cures: A Self-Care Guide for Treating Health Problems with Natural Remedies Including Diet, Nutrition, Supplements, and Other Holistic Methods (Hoboken: John Wiley & Sons, Inc., 2004), 269-274, 369.